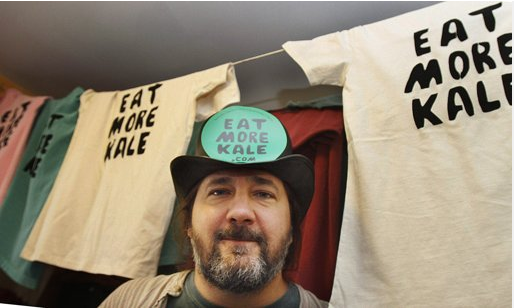 That's Vermont artist Bo Muller-Moore, who sells his curious "Eat More Kale" shirts at eatmorekale.com. There, he says "I'm also about eating locally, supporting local farmers, bakers, famers markets, farm stands, CSA's, community gardens and restaurants, sustainable lifestyles, social commentary and community. Most importantly, I'm about printin' Vermont's one-at-a-time orginial design t-shirts. Have fun and remember: eat more kale!!!" 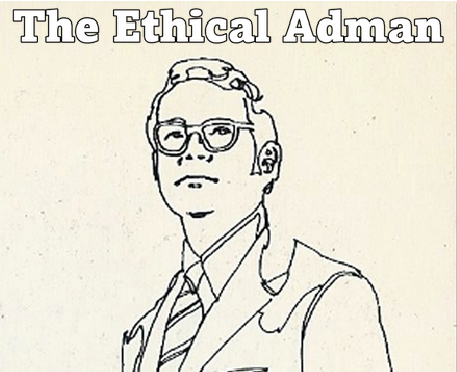 They have sent him a cease and desist letter, and are apparently prepared to sue. They even want him to hand over his internet domain. But Muller-Moore has lawyered up and declares, "Our plan is to not back down. This feels like David versus Goliath. I know what it's like to protect what's yours in business." 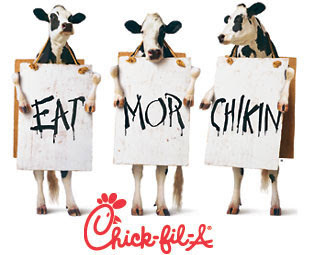 As does the big chicken chain, which will probably not give up either unless it starts to hurt their PR. Let's hope it does.